Mildred S. Dresselhaus, a celebrated and beloved MIT professor whose research helped unlock the mysteries of carbon, the most fundamental of organic elements – earning her the nickname “queen of carbon science” – died on Monday, February 20, at age 86. The Materials Science and Engineering Department at NCSU was honored to have Dresselhaus present the annual Dr. Robert F. Davis Distinguished Lecture in February 2013, entitled “My 50-Year Adventure with Nanoscience.” This event, which was the first-ever use of the Hunt Library Auditorium, attracted a standing-room only crowd of faculty, students, staff and campus visitors, who came to hear the iconic Dresselhaus speak. 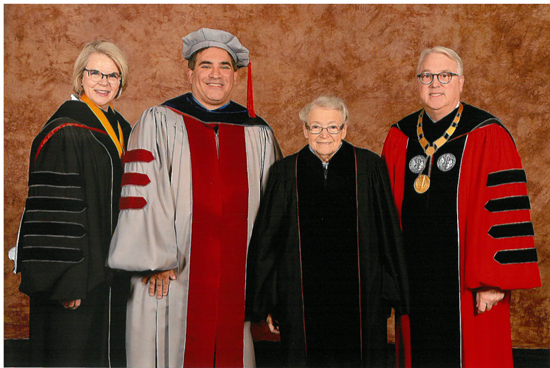 More recently, in December 2016, Dresselhaus returned to NCSU to receive an honorary doctorate, one of about 30 that she had received from around the world. Dresselhaus joined the MIT Lincoln Lab in 1960, the MIT faculty in 1968, and in 1985 was named Institute Professor – the highest faculty rank at MIT. Her work led to some of the most important discoveries in the field of carbon science – involving carbon fibers, graphene, and ‘buckyballs’ (a spherical molecule of only carbon). Dresselhaus was a highly decorated scientist, winning scientific and technical awards including the Kavli Prize, the Enrico Fermi Award, the IEEE Medal of Honor, the Medal of Science, the Presidential Medal of Freedom, and membership in the National Academy of Sciences and the National Academy of Engineering. Dresselhaus was a strong advocate for women in STEM, and just two weeks ago was featured in a General Electric video imagining a world where female scientists like her were celebrities, to both celebrate achievements as well as to encourage women in careers in the science, technology, engineering and mathematics fields. Dr. Dresselhaus died at Mount Auburn Hospital in Cambridge, Massachusetts, following a brief period of poor health.